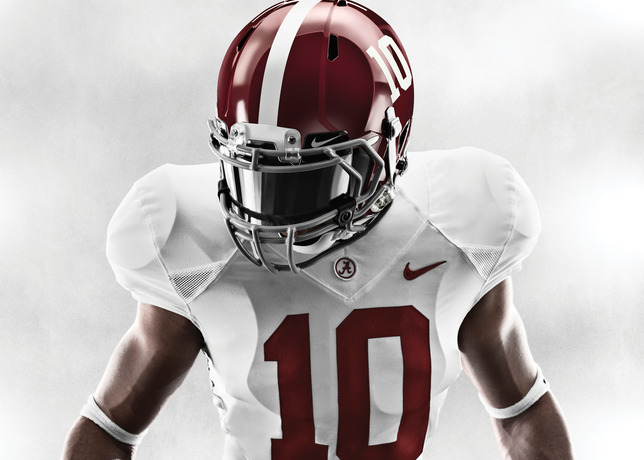 The University of Alabama football team will take the field at next week's BCS title game wearing new Nike Pro Combat Hypercool uniforms. 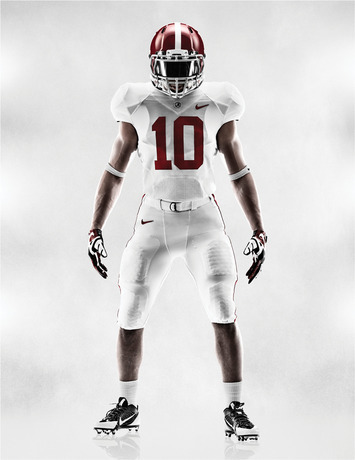 The University of Alabama football team will take the field at next week's BCS title game wearing new Nike Pro Combat Hypercool uniforms, a performance upgrade that maintains the Crimson Tide's classic look while reducing weight and improving thermoregulation. 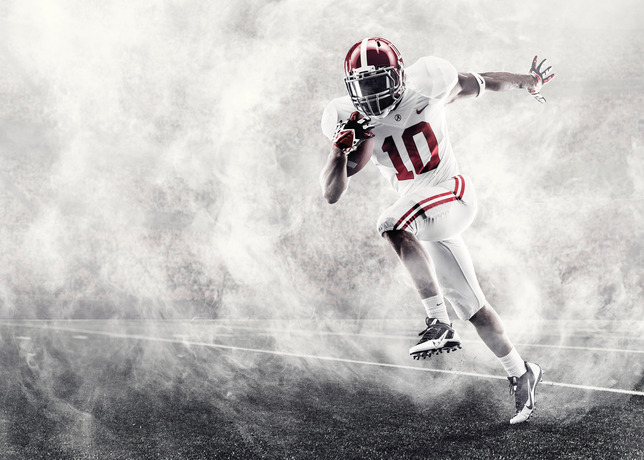 The Crimson Tide uniforms will be upgraded to include Nike Chain Maille Mesh -- a lightweight, ultra-breathable material that emphasizes improved thermoregulation. This new fabrication is incorporated into the back and under the arms of the jersey for exceptional ventilation without sacrificing durability. 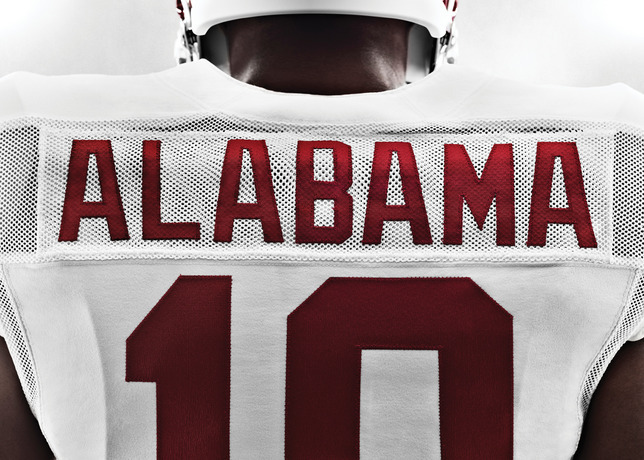 The white-on-white look, embellished with crimson accents, creates the iconic, bold silhouette for which the Tide is famous. 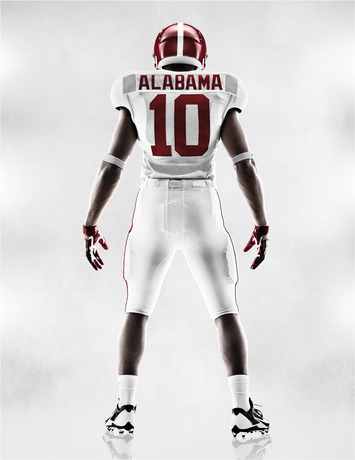 Alabama will also wear the new Nike Pro Combat Hypercool Speed Top featuring Nike Dri-Fit fabrication that transports moisture and sweat from the skin to the outside of the top, leaving the body cool and dry. Regulated for the weather with increased breathability and a streamlined fit, this revolutionary baselayer top features new innovative venting systems including laser perforation pods in a unique design pattern that help the body regulate temperature. 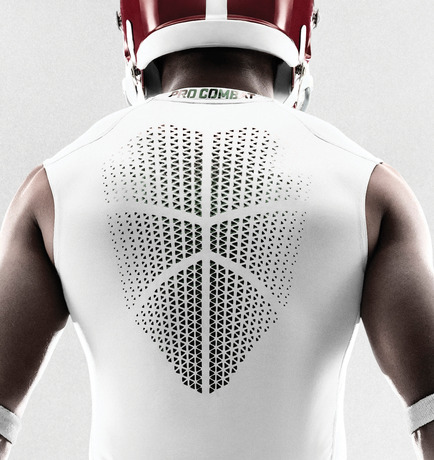 It also features reinforced bonded seams as well as premium mesh underarm gussets for increased thermoregulation. 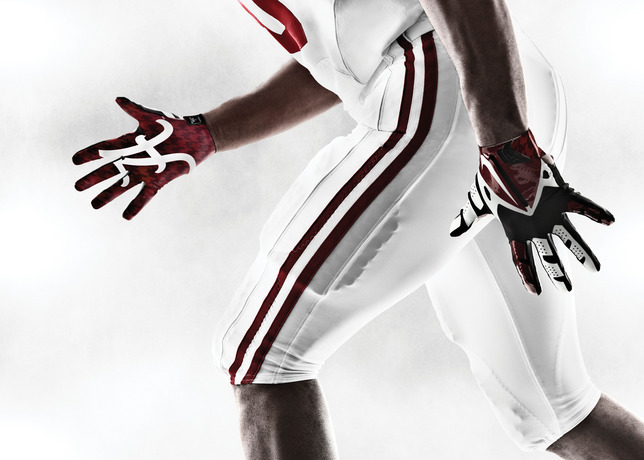 The full, integrated uniform system also features strategically placed seams, pads and cooling zones that help minimize distraction and optimize protective coverage. 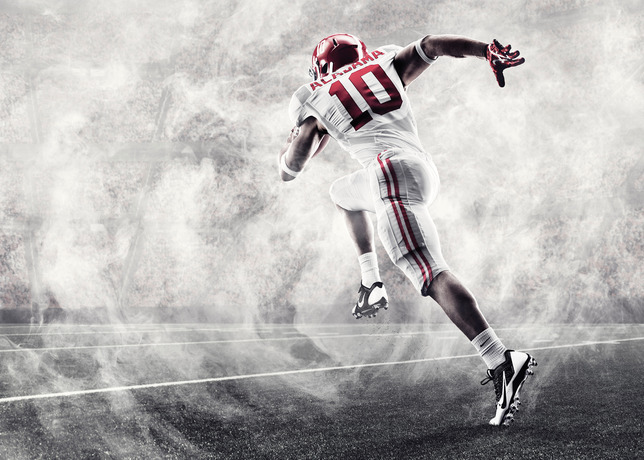 Padding without the bulk offers optimal low-profile impact protection, specifically throughout the crucial “hit zone” between the knees and shoulders. 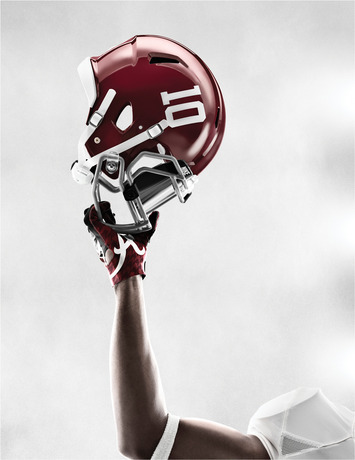 Alabama will also debut the new Nike Vapor Fly Glove featuring seamless Nike Hyperfuse construction on the back of the hand, no-cuff construction to reduce weight and increase grip coverage, next-generation Magnigrip palm material for improved durability and grip, as well as pre-curved fingers for a more natural fit. 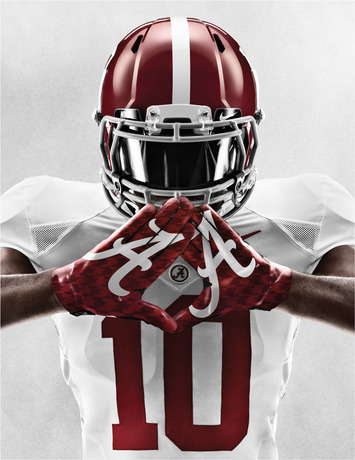 Will 'Bama roll to another title next week? 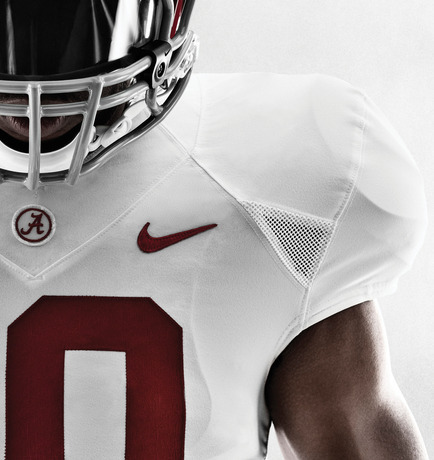 The Tide takes on Notre Dame at the Discover BCS National Championship Game on Monday, January 7.